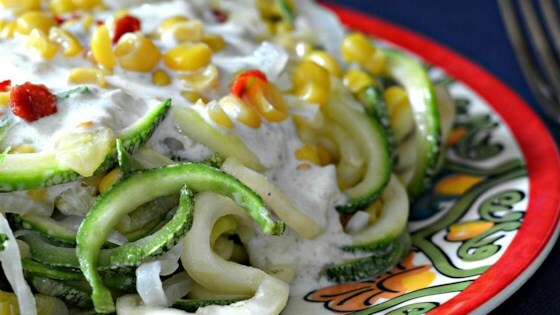 "Mexican squash is spiralized into noodles, also known as squoodles, for this dish with a creamy green chile sauce and Mexicorn®." Heat oil in a skillet over medium heat. Add onion and garlic; cook and stir until onion is translucent, about 5 minutes. Stir in squash and corn; cook, stirring frequently, until squash is softened, about 5 minutes. Transfer to individual serving plates. Combine Neufchatel cheese, chile peppers, and milk in a blender; blend until sauce is smooth. Heat sauce in a saucepan over medium heat until warmed through, 2 to 4 minutes; pour over squash mixture. The Neufchatel cheese and milk will tame the hot green chiles. If you want more of a kick, use jalapenos. Use a spiralizer or vegetable peeler to cut the vegetables into noodle shapes. Very bland, almost no taste.